This park, located on Bell Boulevard between 75th Avenue and 217th Street, was named Bell Park, and later Telephone Playground, in honor of Alexander Graham Bell (1847–1922), inventor of the telephone. The adjacent P.S. 205 is also named for the inventor, although Bell Boulevard takes its name from a prominent family in Queens history. In 1824, Abraham Bell, an Irish immigrant Quaker who became a partner in the shipping firm Bell and Bowne, acquired a huge farm that included most of the present-day neighborhood of Bayside. Bell Boulevard, which was known as Bell Avenue until a street numbering system renamed it in the 1930s, was originally a country lane that divided the Bell farm. Alexander Graham Bell was born in Edinburgh, Scotland, and spent his youth working with his father at University College in London, researching techniques of teaching speech to the deaf. The Bell family immigrated to Canada in 1870. Three years later, Bell acquired a professorship at Boston University, where he taught vocal physiology. Although he was most proud of his inventions to aid the hearing impaired, Bell will always be remembered for the 1876 innovation that earned him worldwide fame and led to the formation of Bell Telephone Company. The great inventor and scientist was also a cofounder of the National Geographic Society, and served as the group’s president from 1896 to 1904. The surrounding neighborhood of Oakland Gardens is named because a private estate called The Oaks used to occupy much of the area. John Hicks, one of Flushing’s original patentees, settled the area in 1645 and named his estate after the trees in the region. The estate, which spread from present-day 46th Avenue to the Long Island Expressway, passed through several owners, and in 1859 was bought by John Taylor, a successful restaurateur from Manhattan. Taylor and his partner, John Henderson, transformed The Oaks into a horticultural paradise with more than 30 greenhouses, specializing in roses and orchids. In 1896, John H. Taylor, son of the restaurateur, organized the Oakland Golf Course on 110 acres in the area. Most of the single-family houses and apartment complexes in Oakland Gardens today were constructed during a post-World War II building boom, when the area turned into a thriving suburban neighborhood. In 1950, the City of New York acquired the land that was to become P.S. 205 and an associated playground. Under the auspices of Parks Commissioner Robert Moses the park opened on April 29, 1955. In 1985, P.S. 205 Playground was renamed Bell Park. After a series of renovations in the late 1990s, the park was renamed Telephone Park. Parks and the Board of Education share responsibility for its maintenance. The current playground design closely resembles the original, despite extensive renovations in 1997 and 1998. 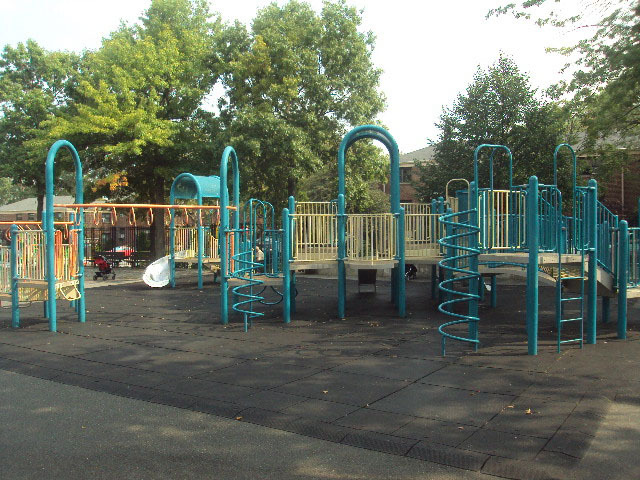 The asphalt was replaced, older wood and metal play equipment were replaced by new models of plastic and coated metal, and new fences were put up throughout the playground. The New York Junior Tennis League suggested the renovation of many New York playgrounds in 1993, and five years later Telephone Playground unveiled newly installed courts. Although some trees and benches were removed to make room for the courts, the park still includes sitting areas, basketball and handball courts, play equipment, and a sprinkler, all in their original positions. With a name that rings a bell, the park meets the recreational needs of both schoolchildren and community residents.